No-frills carrier IndiGo's market share stood at 36.8 per cent in February while that of Jet Airways was 18.4 per cent. Marking a growth of over 24 per cent in passenger traffic, domestic airlines flew 74.76 lakh people in February with majority of the carriers recording over 80 per cent seat occupancy. In February last year, the carriers had ferried 60.16 lakh passengers. 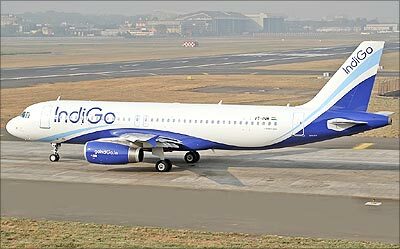 Latest data compiled by aviation regulator DGCA showed that no-frills carrier IndiGo's market share stood at 36.8 per cent in February while that of Jet Airways was 18.4 per cent. Overall, the carriers ferried 74.76 lakh passengers, an increase of 24.27 per cent compared to the year-ago period, a senior DGCA official said. The load factor -- an indicator of seat occupancy – of majority of the carriers, including IndiGo and SpiceJet, was more than 80 per cent, the official noted. Last month, the market share of Air India stood at 15.4 per cent, followed by SpiceJet (13.1 per cent), GoAir (8 per cent), JetLite (2.8 per cent), AirAsia (2.2 per cent), Vistara (2 per cent) and Air Costa (0.8 per cent). The market share of Air Pegasus and Trujet was at 0.3 per cent each, as per DGCA. In January, local carriers had flown 76.55 lakh people. According to the official, a total of 151.31 lakh passengers were ferried by airlines during January-February. This represents an increase of over 23 per cent compared with 122.61 lakh passengers seen a year ago.